Lauren Scharhag: It goes to show you never can tell. It goes to show you never can tell. As I am still thoroughly enmeshed in Order of the Four Sons edits, I'm keeping it short this week. I wanted to share a pleasant discovery with fellow my authors. The lesson is this: you just never can tell what people will want. Back in April, I did a book sale/signing at the Writers Place here in Kansas City. 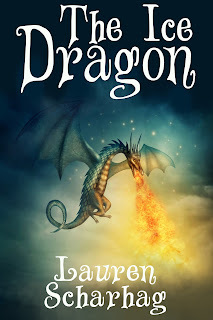 To my surprise, my most popular books were my children's books, particularly a little story I wrote five or six years ago called The Ice Dragon. I wrote it partly as a Christmas gift to my co-author, Coyote, and his children, who were still young enough to enjoy fairy tales. But, mainly, I wrote it as a joke. I know I've shared this story on this blog before, but I'll go ahead and share it again. Me: NO! NO. DRAGONS. EVER! We've stuck to the No Dragon rule in O4S-- zombies, fairies, mermaids, chimeras, undead psychopaths, yes. But no dragons. When I wrote The Ice Dragon, I was basically saying, "Here. Here's your damn dragon." Because if you can't give your BFF crap every now and then, I mean, what's the point? The years went by. I threw The Ice Dragon up on Amazon and Smashwords because-- why not? But I didn't really promote it except at Christmastime because I didn't think anyone would be interested in it outside of the holidays. There was its popularity at the Writers Place. Then someone bought a whole bunch of hard copies from Createspace-- I assume a bookstore or a library. So I thought, maybe-- maybe people would be interested in this story year-round? Last month, I started promoting it regularly, along with my other titles. Imagine my surprise when I got a big response. I sold a bunch of copies-- more than I think I've ever sold in a given month. "Absolutely enchanting . . . My 10 year old student absolutely loves this book." "Brilliantly woven and heartrending, a thoroughly enjoyable expedition. I'm not going to compare it to other books, the style was unique to me. Do buy this book, it's not only good, I dare to say it's important." I just . . . I can't get over it. I wanted to share this experience with other writers-- guys, put yourself out there. It will amaze you what people might respond to, what they might connect with, what might touch their hearts. As for me, apparently I need to write more children's books. I may even throw in another dragon or two. In the meantime, it's Fantasy Month over at the Inspired Writers site. I'm one of the featured authors. If you haven't checked it out already, swing by there. You can grab an additional excerpt of The Winter Prince and enter for a chance to win an autographed copy.